A report released Tuesday detailing caseloads at Nevada courthouses has administrators urging voters to approve a constitutional amendment next year to create a statewide appellate court. 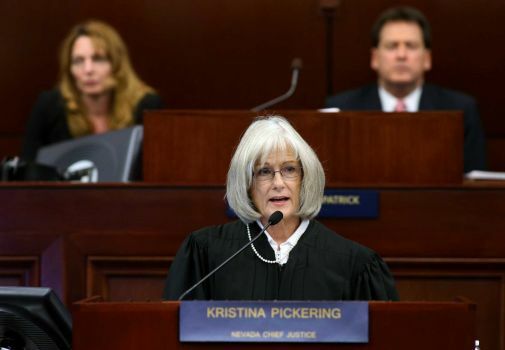 “The numbers show the unrelenting demand for court services in Nevada,” Supreme Court Chief Justice Kristina Pickering said in a statement accompanying the Annual Report of the Nevada Judiciary. Pickering said Nevada courts meet the needs of Nevada business and citizens, despite limited resources and declines in staffing. But she also called the Nevada appeals caseload one of the largest in the nation and a serious problem for people held for months pending criminal trials and for litigants waiting years for the resolution of civil cases. Nevada is one of 11 states, plus the District of Columbia, without an intermediate appeals court. Among those states, the seven justices on the Nevada Supreme top the list in cases per justice, the report states. The Nevada high court received 2,333 appeals in 2013 — far more than the next-highest, West Virginia, with 1,524. The Nevada court disposed of 2,373 cases but it still had almost 1,900 cases pending. Backlogs can be a key measure of court performance, said Greg Hurley, an analyst with the National Center for State Courts. The nonprofit, based in Williamsburg, Va., studies court issues around the country. A study of 2010 court caseloads around the country put Nevada last among 25 states with courts of general jurisdiction in clearance rate for civil cases. Forty-six states have general jurisdiction courts, which hear a range of cases including criminal, civil, family and probate. Nevada also ranked last among 23 states in a comparison of clearance rates for domestic relations cases. Nevada Supreme Court spokesman Bill Gang said Nevada’s district court clearance rates for civil cases improved from 82 percent in 2010 to 119 percent in fiscal 2013, after the state added 10 judges in Las Vegas. The clearance rate in domestic relations cases remained about the same as in 2010, Gang said. The 52-page annual Nevada courts report released Tuesday projects the cost of establishing a three-judge appeals court at about $1.5 million, and suggests it might save other costs. Overall, the state court administration and management budget was just under $62 million in 2013. About one-third, or almost $21 million, went to the salaries of justices and district judges. In all, courts in the 10 districts around the state took in 129,026 non-traffic cases in 2013, or 1,300 more than the previous year. The 82 judges in those courts disposed of 128,170 cases, down 2.5 percent from the previous year. The 52 state judges in the Clark County courthouse handled an average of 1,840 cases each during the fiscal year ending June 30. That made the Las Vegas-area courts by far the busiest in the state. By comparison, the 15 state court judges in Washoe County each handled an average of 1,308 cases in fiscal 2013. The two judges in the 7th District covering Eureka, Lincoln and White Pine counties handled 400 cases each. If you find yourself in an unfortunate situation of losing or about to lose your home to wrongful fraudulent foreclosure, and need a complete package that will help you challenge these fraudsters and save your home from foreclosure visit: http://www.fightforeclosure.net The backlog of Nevada as well as other states where homeowners needs home saving foreclosure solutions may result to the delay needed to plan your effective legal strategy to save your home.